. 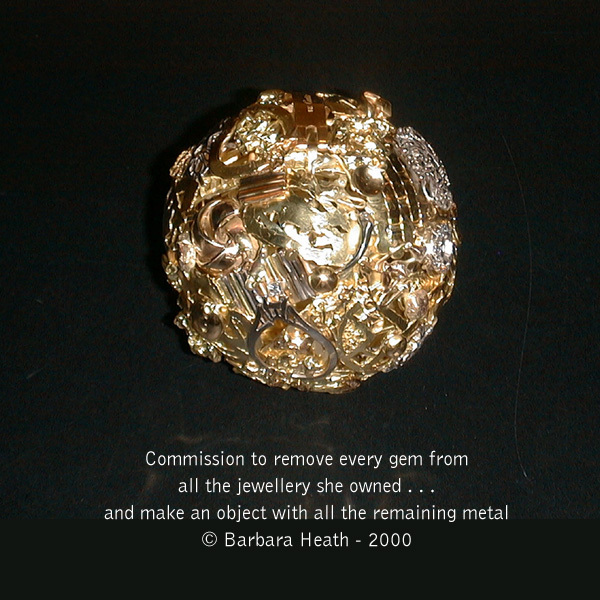 . . it’s true, Barbara’s client who wishes to remain anonymous gave Barbara all the jewellery she owned and asked Barbara to make an object with what remained after every gem was removed. The piece took ages to manifest as Barb considered the implications – beautiful platinium settings, hand made personal objects for many ages were all bashed into a doming punch and made into Barbara’s take – her ‘memory ball’. This piece was borrowed back for the Queensland Art Gallery’s commission review exhibition in 2005 where it again managed to cast it’s story spell.